By the time we went to have dinner last night, the weather had turned from unseasonably warm to seasonably cold. Warm, filling comfort food sounded good, and the restaurant had lobster macaroni and cheese on the menu. Perfect—familiar but fancy, yummy yet fitting for a celebration of being with friends I rarely get to see. 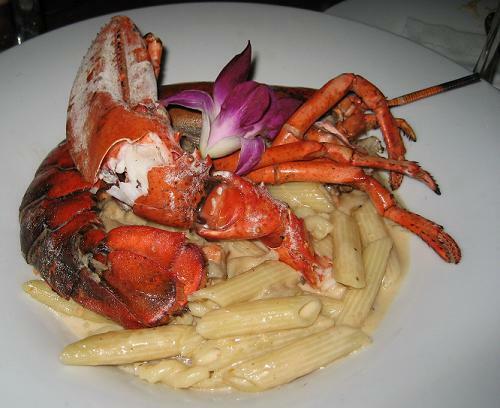 The menu did not prepare me for what arrived at my place–macaroni and cheese with lobster, yes, but I could still see the pincers and the little tiny legs and I had to work at it with a pliers and tiny fork to get the meat out. Metal implements are not comforting. It was tasty, yes, but not what I expected. But that’s what travel is about; if there were no surprises it wouldn’t be as much fun.